In 1995 Shannon Faulkner became the first woman to enter The Citadel - a military college noted for its strict discipline, rich traditions and strong alumni network. As is the case with any cultural change, the transition from single gender to coeducation was not a smooth one - especially during the early years. The Citadel Board of Visitors brought in a new commandant, Brig. Gen. Emory Mace (U.S. Army retired), and a new president, Maj. Gen. John S. Grinalds (U.S. Marine Corps retired), to lead the college out of its tumultuous beginnings with coeducation. Their charge from the board was to make The Citadel the best coeducational military college in the country. Today at The Citadel, women are fully a part of cadet life. They are members of every company in the Corps and can be found in classrooms throughout campus. The graduation of the Class of 2005 in May was the last for Mace and Grinalds. Both retired, saying that their job was largely been finished. Their departure marked the end of an era that brought The Citadel from a national media spotlight and supervision by the U.S. Department of Justice to a point where women are an integral part of the South Carolina Corps of Cadets. With the Class of 2007, women graduates now number 145. Their stories are as varied as those of male graduates. 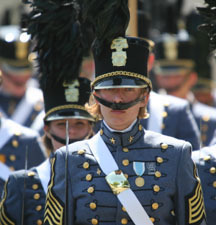 In the fall of 2007 there were 113 women in the Corps of Cadets, accounting for 5.5 percent of the cadet population. The Citadel went from zero to seven women's sports teams in five years - a formidable challenge that was required for the college to maintain its NCAA Division I status. Two women have served as regimental executive officers (the second highest rank in the Corps). Other women leaders in the Corps include two battalion commanders (the third highest rank in the Corps), several company commanders and a host of other cadet leadership positions. More than 50 percent of women in the Corps of Cadets participate in one or more varsity sports. As a result The Citadel is No. 1 among NCAA Division I schools in the percentage of women athletes to total women students. The first graduate, Nancy Mace '99, has completed a master's degree at the University of Georgia Grady College of Journalism and Mass Communications. She has a successful career in public relations in Atlanta. In 2005 she was elected the first female president of the Greater Atlanta Alumni Club. The daughter of former commandant Brig. Gen. Emory Mace, she has written a book about her experiences of being The Citadel's first woman graduate. The second graduate, Petra Lovetinska '00, is now a 1st lieutenant in the U.S. Marine Corps. A Czechoslovakian native, Petra was sponsored by The Citadel Alumni Club of Greater Washington during a time when a contingent of alumni remained opposed to the admission of women. She is currently stationed at Norfolk Naval Air Station. The past decade has brought about a fundamental change at the college where cadets still brag about having the longest and toughest fourth-class system of any military college in the country. The Citadel takes pride in the fact that it now graduates successful women who are prepared to take on leadership roles just as successful male graduates have since the college's founding in 1842.